Here's a quick update on progress with the HAPP's structure. From previous posts you might recall the HAPP has an outer aeroshell that I custom-fabricated from carbon fiber in an extremely labor-intensive process spanning multiple months. For a refresher, see my old posts about the Plug, Mold, Composites, and Part. The central structure, which includes the main strut and Earth Landing System (a.k.a. parachute mortars), drops into the top of the aeroshell and cinches into place with Velcro straps. Between the bottom deck of the structure and the lower aeroshell is a small gap that needs to be filled with some type of impact-absorbing material. This material will help absorb kinetic energy as the HAPP touches down at landing. Which material should I use? I played around with materials of various densities and elasticity, such as styrofoam (inelastic) and neoprene (too dense and heavy). I also experimented with expanding polyurethane foams, both the rigid and flexible varieties. I finally found the right material: FlexFoam-IT! X from Smooth-On. It's a flexible PU foam, but one of the stiffer varieties. The foam expands and hardens in a few minutes after mixing the two components together. The resulting material is spongy and fairly lightweight. For those who care about such details, the two chemical components are a polyol (Part A) and an isocyanate (Part B). Together these react and form an open-cell polyurethane. Although Smooth-On doesn't divulge the details, I suspect one of the components contains water. The presence of H2O, after some intermediate steps, eventually results in the production of carbon dioxide gas. The CO2 acts as a blowing agent and foams the polyurethane like a mousse. FYI the giveaway for the water is the visible presence of an amber-colored polyurea "hard phase" in the material under certain conditions...one of the chemical consequences of adding H2O. Next I needed a mold to contain the foam as it expands and deliver the proper shape. For the bottom side of the mold, I simply used the inside surface of the lower aeroshell. This ensured a perfectly-curved pad that fits the aeroshell precisely. I made the walls of the mold from an old plastic bucket turned upside down. I made the the top of the mold from a piece of generic foamcore board cut to fit. Fortunately, the diameter of the bucket almost exactly matched the diameter of the main structure's lower deck, which gave a properly sized pad. I secured the foamcore board in the correct location with metal angle brackets... and the location was easy to determine now that the HAPP is fully modeled in 3D CAD. Inserting upper side of mold into bucket. Metal brackets are covered with foam tape. I took this pic after de-molding 2 pads. 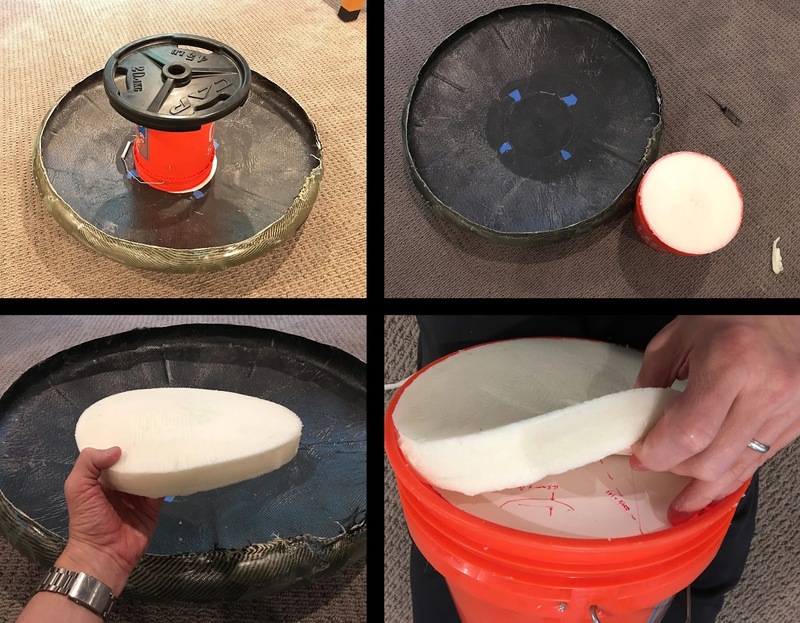 After waxing the makeshift "mold" with release agent, it was time to mix the expanding PU foam and pour it into the mold. 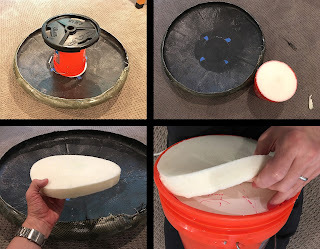 I poured a blob right into the center of the aeroshell and quickly set the inverted bucket on top, holding it down with a heavy weight to contain the foam's expansion. After the foam cured, I peeled it out of the mold and trimmed off any excess flash. Voilà - a perfectly sized, custom-molded crash pad of just the right density. Pad weight is 248 grams. That's a fairly substantial weight penalty to pay for good impact protection, but probably worth it. We'll see how things hold up in flight testing. It might be possible to cut some chunks out of the pad to economize on weight, perhaps leaving a thick ring with a central donut hole. (4) Finished pad after trimming flash. Below you can see how the pad is situated in the HAPP. Before inserting the structure and ELS assembly, the pad is positioned in the location where it was molded. The structure is dropped into place and the lower deck compresses the pad slightly. camera, sitting next to aeroshell. Right: Inserting structure into aeroshell. Foam pad placement is visible.